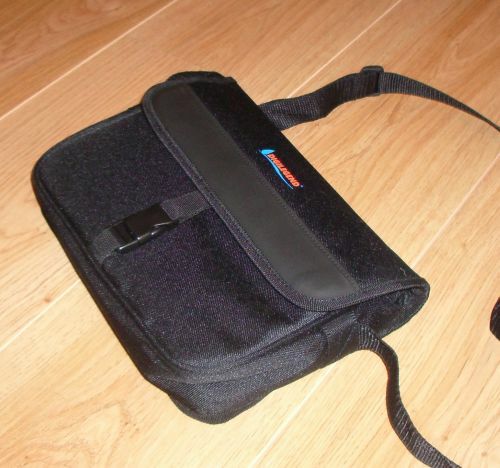 Unlike the other cases which I have reviewed, the Digilegend case is a satchel-style, with a shoulder strap (but no shoulder pad). 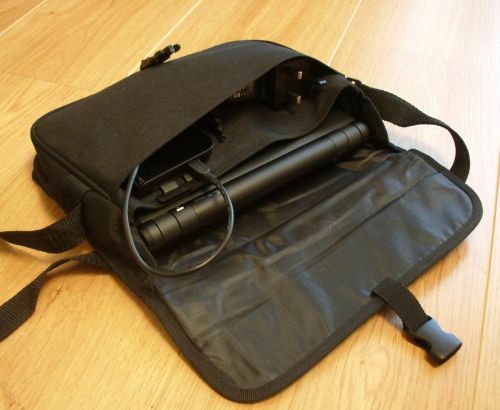 This makes it absolutely ideal for carrying around; with the weight of the EEE, it would be very easy to sling the case of your shoulder and forget about it. As one might expect, the shoulder strap is adjustable, so you can make it as long or as short as you wish (within reason! ); it’s worth noting, though, that you cannot remove the strap completely without modifying the case, as it is sewn firmly in place at one end, although you could tuck it into the bag. However, if you do not want a bag with a shoulder strap, then, this probably isn’t the bag for you, really; the shoulder strap is a useful selling point, to my mind. The case has relatively thin padding all on all sides, and is made of reasonably sturdy canvas-like material, which should protect your EEE from most scratches- it is a robust case. However, I would not expect it to offer much, if any, protection from a fall, although, it is not advertised as being shock-proof, or anything like that; in this respect, it does, however, offer more protection that the Asus slip-case supplied with the EEE, it would seem, although, if you really were concerned, you can just about fit the EEE in the slip case into this Digilegend case, although, it is a tight fit. In terms of keep the case firmly shut, Digilegend employs a clip fastener, which is a very good idea – it has a good, solid action, and feels sturdy, so I would not be worried about it coming undone accidentally. This is pretty important if you a planning on chucking the case over your shoulder, and is, to the best of my knowledge, the only case for the EEE which incorporates this type of clasp. As well as being secure, it is quick to open – when your computer boots in 30 seconds, you don’t want to have to spend a minute or so trying to get the thing out of the case first! The flap comes completely over the top of the case, and, in what I think is a clever design, the top of the bag part of the case is slightly tapered; the EEE can be easily slipped in and out, but means that none of the EEE is exposed- a very nice touch. The interior of the case is split into a main pocket and a front pocket, both of which are under the flap. The main pocket will hold the EEE, and the front pocket a small external hard drive, or, with a noticeable bulge, the AC adapter. Because of the way the case is held shut, I’d be confident carrying around the EEE and the adapter without having either falling out. In fact, I was able to hold all my EEE accessories in this case (including my spare battery), although, as you can see from the photograph, it was a bit of a push. If you are out and about, and want to have the EEE with you, though, it’s certainly doable. The case itself is relatively light, and does not add substantial bulk to the EEE. In this respect, it’s great for keeping all your EEE’s accessories together in one place, ready to grab and go. Other than the printed Digilegend motif on the centre of the flap, the case is matte black, which is excellent if you do not wish to draw attention to it. Because of its size, it does not really look like a laptop case, which I think is a bonus, although it does look a little more corporate than, say, the Fabrix cases. I’d certainly have no qualms using this case in the office, or in my personal life. The price also goes very much in favour of the Digilegend case- it is $17.50, with payment due via PayPal. At the current exchange rate, this makes the case less than £9, which is pretty remarkable, all things considered. 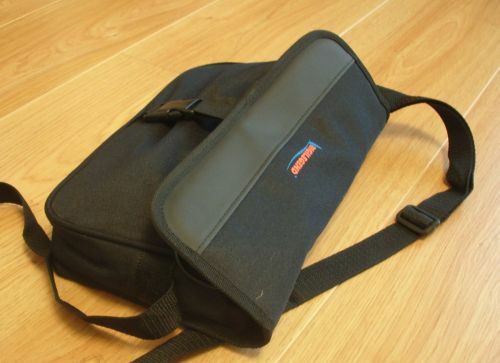 Certainly, I’d be happy to carry my EEE around in this case, both in terms of practicality, robustness and looks, so I think could be a very good investment for those who want a case with a shoulder strap. The review was prepared with a sample supplied by 3eportal. You can purchase directly from 3eportal. This entry was posted on Tuesday, February 5th, 2008 at 11:27 am and is filed under Reviews. You can follow any responses to this entry through the RSS 2.0 feed. You can leave a response, or trackback from your own site. Plenty of padded clip pockets for accessories. The Uncle Mike’s case is called a Pistol Rug by the shooting fraternity. According to their web site – [url]http://www.unclemikes.com/[/url] – they make two sizes that would be suitable for the e3: 11″ x 7 ” #5221-1 and Large 14″ x 7 ” #5222-1 in black #5222-2 in green. Their shipping calculator only covers the US and Canada so you’ll have to email them for costs – or pay more through Amazon through the previous coment. I looked at DVD player cases at Wal-Mart (Shame on ME!) One was very similar to the caselogic mentioned by tesla 120. I didn’t buy it for the simple reason that there was no room to store the power cord which I would to take with me when traveling or headed to a meeting. Right now I am considering an insulated lunch bag that I saw at a discount store. Need to go back with my eee to make sure it fits. I’ve just been to STAPLES (UK Stationery store) & bought a pencil case for my eee which set me back £2.49! The eee caused a stir in the store & all the staff wanted to see the laptop that fits in a pencil case! I bought the Case Logic DVD player case yesterday. The Eee actually fots in the slimmer section in the back, originally inted for a few DVDs. That leaves the larger main compartment for power cord, mouse and plenty extra room for a wallet, cell phone etc. It was only $15. I bought the Case Logic DVD player case yesterday. The Eee actually fits in the slimmer section in the back, originally intended for a few DVDs. That leaves the larger main compartment for power cord, mouse and plenty extra room for a wallet, cell phone etc. It was only $15. I am new here. Just got my Eee 3 days ago. Very impressed. Exactly what I wanted. Was able to import all my contacts from my Palm within minutes. Still trying to find a way to transfer my past calender events from Palm to Eee. Could not get that done yet, even via Palm Desktop. Does anybody know how to do it? I am new to Linux.